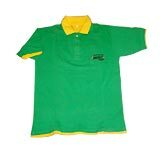 Exalon promotion is manufacturer of all kind of T-shirts , we deal in corporate merchandise like T-shirts with corporate logo in embroidery, printing , sublimation screen printing etc . These t-shirts can be the method to promote your organization with the least of costs. So try this idea as many of us have efficiently done Corporate logo polo shirts usually are the number 1 valuable tool for advertising your industry and reasons business logo polo shirts can help you advertise your own industry in a simple way. Let your staff to wear them instead of an uniform. That way they are much relaxed, they could advertise the corporation when they are dealing with Clients, shoppers and they can be very easily spotted throughout an event or show. Promotional / corporate T- shirts are generally the most important preference for clothing for a lot of men and women because they are flexible and also easy to maintain and they can certainly be put on from day to evening, Today you could get polo shirts in just about each and every color and absolutely in numerous styles Specifically if your company has something contemporary to give, it is possible to combine these two things and you will note that your clients will soon be your number one tool for promotion. Even if this isn’t the case though, it is possible to use polo shirts for establishing your business name and generating it a part of among teenagers and younger individuals who wanted to wear them. Women prefer far more vivid colors and designs that have a slimmer fit. It is possible to follow the styles according to the target group of the item you might be dealing with or work with the traditional technique to reach extra individuals.